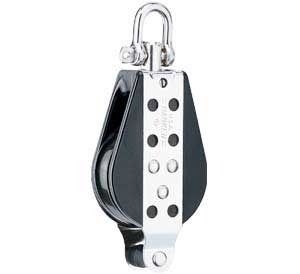 length:6-1/4width:2 weight:11 ozshackle:3/16 sheave diameter: 1-3/4 Double block with becket and adjustable shackle. Safe working load is 1150 lbs. A block's becket is a thimble, a metal ring at the end opposite the block's anchoring fitting. Beckets are found on both single and multi-sheave blocks. These blocks are used in tackle designed to multiply mechanical advantage. The end of the working line is secured to the becket of one of the blocks, depending on whether the total number of sheaves is odd or even. This adds an additional section of line pulling on the load.